Robyn Davis Sekula is a freelance writer and public relations consultant who helps us with a variety of tasks. She helps maintain this blog and writes posts on occasion. This week, Robyn wrote about her own experience paying for her wedding and her tips for how to have a great wedding on a budget. In 1996, I did something that others consider to be a bit unusual. I got married, and my fiancé and I paid for almost the entire wedding out of our own pocket. My parents gave me $1,000, and my in-laws paid for the rehearsal dinner. But the wedding itself, and the honeymoon, came out of our own pockets, without debt, and without some sort of crazy corporate sponsorship scheme (which, if I had thought of it, I might have tried). I’d like to share a few thoughts on how we did it, and why, in hopes of helping those who are getting ready to get married themselves. To appreciate our story, you need to understand that my future husband and I made a combined $40,000 or so, and we did not live together. I moved in with a married couple I knew, mostly to save money. Greg was a homeowner. We had separate living expenses, and no second jobs. 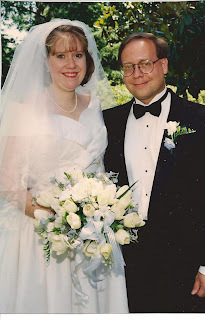 To this day, I can’t tell you exactly how we came up with $10,000 for the wedding and honeymoon in a year. I know that we are both cheapskates at heart, and my rent was crazy cheap. Those things helped. It also helped that we both wanted the same things in a wedding. Our first cheapskate stunt was buying an engagement ring at a pawnshop. Greg had shared with a friend who knew a lot about jewelry that he wanted to propose, and she called one day to say she had been to a pawnshop and spotted a very good three-diamond ring for $500 that was worth far more. Greg filled me in, and we looked together. He didn’t want to make such a huge purchase without my endorsement. I loved it, and it fit. So we bought it. Next stop was a jewelry store, where we asked if we had gotten ripped off. They said, “We could not sell you one diamond for what you paid for this ring.” In my mind, this story illustrates why we get along so well. Greg likes a bargain, and thought nothing wrong with buying an engagement ring in a pawnshop. I’m a girl who loves a bargain, and sees nothing wrong with receiving a ring that was purchased in a pawn shop. I don't believe that "stuff" carries bad vibes. It's an object. Then we began talking about what type of wedding we wanted. I was raised Baptist. Baptists generally think a wedding, including reception, should be over in about 90 minutes. You have a short service in the sanctuary, go to the basement fellowship hall for mints and peanuts and you’re outta there. No alcohol, because Baptists typically do not drink. Seriously, Baptist weddings are cheap. Greg, however, is from a Catholic family, all of whom would be traveling, and they would expect to drink and be fed. How to combine those two competing interests? We started with a list. We each made a separate list of what was important to us in a wedding. We both had good music at the ceremony as high on the list. We also both wanted to have a full meal at the reception. Low-ranking were flowers and cake. I also had high on my list quality photographs. Personally, I think one of the worst trends in weddings is dispensing with professional photography. That is the ONE keepsake you get from your wedding. You’ll want good photos, and so will your kids and grandkids. Spend the money on good photography. I can’t tell you how many friends have forehead-smacked themselves for foregoing this. Anyone who has been married will likely tell you that this matters. Another item that really mattered to me was helping to pay for my bridesmaids’ transportation and dresses. I’ve always felt that making people buy a dress and shoes they’d never wear again and then pay for travel to get to the wedding site, and lodging while they were there, is a tall order, especially for the young people usually in the wedding party. For one bridesmaid who was a grad student, I bought her dress, plane ticket and found a friend for her to stay with. If you’re going to spend $10,000 on a wedding, I see no reason why $200 for a plane ticket and $125 for a dress is a problem. Everything else we did I saw as open to negotiation. I met my mom at a bridal dress outlet and found a dress I loved for $500 (a bargain even then). I love the dress, and still do. But I didn’t have any interest in paying retail. Instead of a limo, I talked to rental car agencies to see if I could rent a white Cadillac for the day of the ceremony. Sure, they told me, and they got it for me. $40 for the entire day, and a friend relished the idea of being the driver. It was fun, elegant, and nice. I called many florists, and found one in a small town 30 minutes away who was willing to work with my budget. Another friend of mine hired a florist who regularly displayed at her local farmer's market - another great tip. The florist was less expensive and the bouquets wonderfully natural. I found a new caterer who was just learning her craft and I’m pretty sure gave me a good discount on food. I also selected a time of day for the wedding that I thought would absolve me of the responsibility of having a full bar: 11 a.m. We had a beautiful morning wedding, and served wine only at the reception. I personally hate cash bars at weddings. I think it’s tacky. But I also understand it is incredibly expensive to offer a full bar to guests. Yes, a wedding is your day. But it’s A DAY. Do not, under any circumstances, go into debt for a wedding. And by the way, you aren’t owed a wedding. No one is required to pay for it for you. Presumably, if you’re getting married, you should be ready for paying your own way through life. If your parents pay for your wedding, it is a wonderful gift. Be grateful. A wedding is a great way to try your hand at budgeting, perhaps for the first time, with a future spouse. If you can’t agree on this, though, think about whether or not you have what it takes to go long-term. It only gets harder, particularly if you don’t agree about money. This morning, I appeared on KMBC-9 to discuss financial matters. I am really pleased to appear there from time to time and happy to answer questions from viewers as well as their own staff. If you have something you'd like to see me address in one of these future appearances, let me know and I'll be glad to do it. QUESTION: What percentage of their income do most Americans spend on vacations per year? What do you think is appropriate or safe? 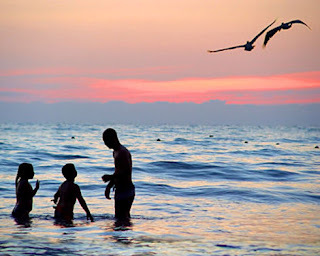 ANSWER FROM DAN DANFORD: Sarah, a recent Gallop poll found that almost 60 percent of Americans who usually take a family vacation are planning to downsize or cancel this year. Together, that's an estimated $30 billion drop in travel spending this summer. Tough for the industry, but generally good for families wanting to travel. Rules of thumb aren't much help here. Families differ too much in terms of income, size, geographic region, and personal taste. One family's summer trip to a Minnesota fishing lake doesn't compare well to another's annual pilgrimage to Cape Cod or Aspen. And other families consider any vacation an extravagance. There's little common ground for good comparison. Here's what I can say. Bargains abound. No matter your preference of time, place, or amenities, costs will be lower than any time in recent memory. Hotels, resorts, cabins, boats, airfares, car rentals, and even para sail rides will available for remarkable savings. It's a buyer's market for summer vacations. A couple of suggestions. Look for bargain vacation packages assembled to lure travelers. Use credit cards for booking, but pay them off or use cash when buying. Any savings will vanish against high interest rates. Last, don't go if you don't have the money. Vacations are about good memories. Don't try to manufacture good memories out of bad times. First of all, it doesn't work very well. Second, the struggle to pay later could damage any good memories. Believe me, vacations are about time together, not fancy destinations. You can have a lot of fun without spending a lot of money. Especially this summer. I can understand the allure of chess. It’s pure intellectual challenge; just you and an opponent, focused on making the right moves and winning the ultimate battle. Every move by your opponent creates a new challenge. You adjust or you lose. Investing offers similar challenges. Every day important variables change. The economy. World tensions. The management of companies you own. Competition. Technology. Everything changes. So it’s not too surprising that so many people enjoy the challenge of investing. Like chess, it’s a game. It’s a game that tests your intellect, your instincts, your ability to think and act quickly. But it’s not really a game. Results matter. Will your children go to college? Your grandchildren? Will you retire in comfort? Will you outlive your savings? Will there be anything left to pass along to chosen family members or charity? Truthfully, investing is a very serious business. And you need to treat it that way to succeed. Although it’s nearly impossible to beat the market on a consistent basis, there are time-proven ways to invest for success. Follow these, and you’ll likely achieve your financial objectives. Ignore them at your peril. Learn the rules. Ric Edelman wrote a bestseller called The New Rules of Money (1998, HarperCollins) and I recommend it highly. Most investment basics can be gathered rather quickly. Be wary of materials created by the marketing department of some investment firm; they were designed to sell, not to educate (the same for sponsored seminars). To learn, visit a library or take a college personal finance class. Know your tools. Stocks, bonds, and mutual funds are basic building blocks, although there are thousands of variations of each. You can’t make good decisions if you don’t understand the options. You can’t understand the options until you spend time learning them. Believe me, you don’t really know today’s tools if the last time you looked was during the Reagan Administration. Monitor the surroundings. Investing isn’t done in isolation. It’s not enough to read Money magazine or glance through The Wall Street Journal. You have to follow national and international news, too. You’ll need a smattering of economics, political science, and sociology. You’ll also need a lot of humility. Truthfully, the future is difficult to predict and that makes investing problematic, though not impossible. Even professionals face frequent failure. Today’s talking head on CNBC is destined for obscurity tomorrow. Be realistic about your ability. Behavioral scientists tell us that over-confidence is a major problem for investors. Test after test shows that people think they are better than they actually are. This same faulty belief leads investors to trade too much, guess wildly about the future, and see trends where none exist. When it comes to ability, many of us choose the wrong game entirely. Our chief talent lies in earning money, not investing it. Energy devoted to career enhancement or more education often brings substantially more success than investment activity. Put energy where potential results are greatest. Seek quality help. Investing is complex. There are thousands of options and important variables change every single day. On top of that, most of us have a huge emotional response regarding money. Almost everyone could benefit from a trusted, knowledgeable advisor. Adjust. Family and goals change over time. So does the world of investing. It’s amazing the number of people still using investment ideas taught by a trusted teacher or friend three or more decades ago. What did Grandpa teach you about 401(k) plans, index mutual funds, or Internet trading? It’s probably time to make some helpful adjustments. Focus on your goals. This may be the hardest part of investing today. Our world is full of noise. Twenty-four hour market news. Dozens of talking heads offering “helpful” advice. It’s all very distracting and it’s all very unnecessary. Market noise is a short-term distraction, while investment success is a long-term process. Identify goals. Seek strategies and products likely to meet them. Make adjustments when something dramatic changes or if something better comes along. Seek quality professional help along the way. Investing is not a game. But you can come out feeling like you’ve won if you follow the rules. It’s hard to say how reporters choose the subjects that they do. But somehow, a reporter for USA Today zoomed in on Mexico, Missouri, and particularly, my uncle Randy Sawyer. The story centers around a recent poll that indicated that while many Americans are still in an economic tunnel, more are beginning to see the light, and believe that the recession is on its way to a conclusion. I like that brand of optimism, and agree with it. Congratulations to Uncle Randy for a few moments in the spotlight. Humberto Cruz is a bright, astute financial expert who answers questions from the public. Today, he answered a question about annuities in the Kansas City Star. You can see the question and his answer here. Here's my thoughts on it. These types of products become more popular during market turmoil. It's human nature prevailing over investment history. To me, the worst time to enter into contracts like this is as a response to the investment environment. In essence, you are entering into a long-term contract (fifteen years at least) because of shorter-term market conditions. And, in this case, you are doing it when interest rates (used by the insurance company to determine your payout) are near historical lows. Good for the insurance company and bad for you. Need I add that it's an easier sale for insurance agents, too? In some circumstances, using an immediate annuity could be a wise choice. But the wisdom of that choice is best determined when the markets are more "normal." My advice would be to carefully consider the options over several months. Try a ladder as suggested by Mr. Cruz to catch some better payouts when rates rise again. Don't let fear drive your retirement decisions. On Mondays, we answer questions on our blog from readers. If you have a question for us, we'd be happy to answer it. Please post it in the comments section or e-mail robynsekula@sbcglobal.net. QUESTION: Out of fear, I haven’t been opening my retirement account statements for months. It seems that the market is recovering some, though. Is it safe to open them now? 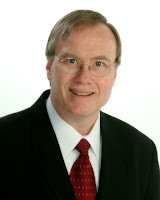 ANSWER from Dan Danford: The stock market is better now than it was earlier. The Dow Jones Industrial Average hovering around 8600, up from a low of 6400. If you owned stock funds in your 401(k) mix, the statement probably looks better today than it did several months ago. Even so, it still looks considerably worse than several years ago when the market topped above 14000! Short-term market swings are virtually unpredictable, so your best long-term bet is to build a diversified portfolio - both stock and bond mutual funds - and ignore the blow-by-blow media reports. Open the statements once or twice a year, then toss them. Your goal should be to maximize returns until and after your retirement date. Forget the weekly, or even yearly, fluctuations and you'll be prepared when the time comes. We provide regular commentary and podcasts for Dad's Divorce, a web site that helps men through the process of divorce. My podcasts concentrate on financial issues. A link to my latest podcast is posted below. In a sense, Jonathan Clements’ new book was painful to read. Clements was the long-time personal finance columnist for the Wall Street Journal, and he has a real knack for explaining investment stuff. He wrote nearly 1,000 columns for the Journal and he’s forgotten more about personal finance than many brokers ever knew. 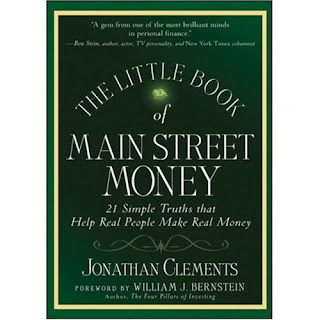 The Little Book of Mainstreet Money, 21 Simple Truths that Help Real People Make Real Money is an excellent book. I recommend it highly to anyone who needs a basic finance guide, or those who want a refresher course. In Clements’s usual style, it’s easy to read, understandable, and helpful. I’ll add this to our website’s recommended reading list. Clements once famously noted that there are only seven real stories in personal finance, and he cites them in his introduction. I won’t list them all here, but one is “simplicity is a great financial virtue.” I agree with his other six, too, but as a practicing advisor, this one stands out as genuine wisdom. There are few absolutes in economics or finance, but that comes pretty close! It tracks that his 21 Simple Truths follow this theme. He tackles everything from portfolio construction to the merits of saving. Each chapter illuminates a different topic, and offers explanations, ideas, and suggestions, all in that comfortable and engaging style he’s known for. Why, then, was my reading painful? Another simple truth is that every thinking adult should already know much of this stuff. Seriously, folks, this isn’t nuclear physics and these truths aren’t obscure. These are the pots and pans of personal finance and every home should already have a basic collection. It just hurts to acknowledge (again) that – as a people – we’re rich in things, but poor in basic money knowledge. People should already know the merits of diversification. They should already know that every investment (every single one) has risks. They should know that tax deferral is smart and that today’s retirement can last many decades. If they don’t, then this little book makes those powerful and productive points. And, in many ways, Clements makes them and others better than anyone else could. He has a gift. I like Jon Clements and I recommend his book highly. I just wish that it wasn’t necessary. EDITOR'S NOTE: We post a question from a reader and a response from Dan Danford every week, usually on Mondays. If you'd like to pose a question to us, post it in the comments. QUESTION: I am self-employed, and my husband has a retirement account through his work. He works at a non-profit, so it is a 403(b). Right now, we’re contributing 15 percent of his income to his account, and saving nothing else for retirement beyond that. We have about $100,000 put aside for retirement so far and we’re in our late 30s. We can contribute more to his 403(b). Should we do that – or consider some other option such as a Roth IRA? ANSWER: There are a variety of retirement programs for self-employed people, and determining the best one for you requires more information than you provided. Some are based on Individual Retirement Accounts (SEP or SIMPLE) and others are more formal (a one-person 401(k), perhaps, or a small pension). Traditional or Roth IRAs are an option, too, but the annual contribution limits make them more suitable as an augmentation than a complete retirement plan. 403(b) plans are similar to 401(k) plans, except they are provided through educational, medical, or certain nonprofit employers. I encourage their use, but they usually lack an "employer match" which is one thing that makes other retirement plans so popular. You are doing the right thing by using the 403(b). The right next step is based on your retirement needs and the best way to fund them. Visit with a good advisor who can review the details of your circumstances and help you craft a successful course. Good luck. Editor's note: Here are a few more links to some stories written by folks who tapped into some of our expertise. Always happy to help - especially when we're working with people who get it right and sincerely want to help readers, as these reporters do. As much as the media gets bashed, we've had so few bad media experiences we can't recall but a handful. It's a tough job and we appreciate what they do. Editor's note: We give out a daily financial tip on Twitter @family_finances. Recently, our tips have centered around teens and summer jobs. Here's a list of all of those tips in one place. - Teens learn discipline and the value of a dollar in summer jobs. Encourage your teen to work. - Teens too young to work in a real job can find babysitting, lawn mowing work to give them extra money. - Children too young for any kind of outside work can help around the house and earn money for chores. - What was your first summer job? What did it teach you? Those lessons now available for your teenage kids. - Teens who have a form of income should contribute to cost of operating a family car, clothes, spending money. - Teens will learn a lot from saving up for a goal, such as a car. Even if you have the $, make them pay for some things on their own. - Ask older teens to contribute in some way towards college. Scholarships, money saved are 2 ways to help. Will mean more to them. - Summer jobs are a great way for college students to learn a business. If you have a business, give them a small job to teach them. - Teens can approach those working in field they like and ask for help securing summer job/internship. Good experience. - Prepare teens for summer jobs by talking through value of work & why you have to put up with some things. Also teach them when to walk. 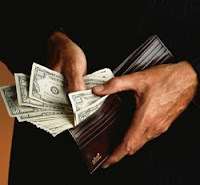 - Set a monetary goal with your teen for the summer, even if not working for anything specific. Offer incentive if they meet it. - Help teens set up a budget with their summer job money. Include some saving and some spending. - Educate your teens now about the danger of credit cards. Make sure they know the risks. 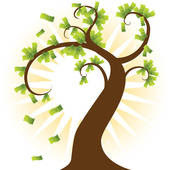 - Help your teen open their first checking account. Teach them how to balance it against the statement. Here’s the disclaimer. I hate sales commissions. Not just in the investment industry, but everywhere. I understand that they are a fact of life in certain trades or businesses, and that they aren’t going away anytime soon. And I also understand why they exist. In its simplest form, a sales commission is capitalism at its purest. Employees who sell the most are rewarded the most. I’m one of the strongest capitalists you’ll ever meet. I like business and I love entrepreneurs. I’ve started two companies myself, and I serve on the local Chamber of Commerce Board. I earned an MBA and I’m a champion for small business owners everywhere. I like employers and I absolutely love productive employees. Take a group of employees and assign them widgets to sell. Each widget sells for $10, and each salesperson keeps $1 for each widget sold. At week’s end, the person selling the most gets paid the most. It’s a simple system, and it works really well for the company. Besides rewarding the most productive employees, it also limits the boss’s salary expense. No sold widgets equals no salary. Similarly, when times are fat, everyone makes money. Who could argue with that? Well, I can, and I will. None of those arguments work for the consumer. In a lot of ways, sales commissions are actually bad for consumers. - They align the salesperson’s financial success above the customer’s. - They add costs to the product. Without the commission, that widget would sell for $9. - They reward employees primarily for their persuasion skills and charm. - It’s true that they only get paid when a buyer decides to buy, but that doesn’t mean that the buyer necessarily reached an informed decision. In fact, most of us know that the exact opposite it true in many cases. Does anyone buy a new car today without Internet research? We know the accessories, manufacturer's suggested retail price, dealer’s invoice, and even the auto’s safety and other ratings from respected third parties. For a used car, we can easily access the car’s accident and repair history. Truthfully, most of what the salesperson does is accompany us on a test drive and add $1,000 to the price. The same thing is true with mutual funds and insurance policies. Anyone can look up Morningstar fund ratings or get Internet price quotes. It’s true that a professional can add experience and judgment – even valuable experience and judgment – but throwing a sales commission into the pot can ruin the stew. Morningstar tracks some 25,000 different mutual funds or share classes. Some feature commissions to salespeople and others don’t. If your investment advisor (agent, broker, representative, or consultant) gets paid through sales commission, then they’ll only be showing you some subset of what’s available. And that subset, however large or small, features higher fees to pay those commissions. Don’t misunderstand me. I think most investors need professional help. I’m not against hiring a bona fide advisor to help create and monitor an investment plan. What I’m against is paying that person through the sale of certain products or services. Especially if other products and services might to a better job for a lower price. That’s the hidden hazard with most sales commissions. Information we receive shouldn’t be distorted by the salary scheme. Is the Chevrolet salesperson ever going to tell you that a Ford truck is better value? When you last visited the Verizon wireless store, did they volunteer that Sprint might offer better value for your usage and region? When was the last time a paid salesperson told you “no, that’s not the right product for you.” Wouldn’t we be happier if they did? Like I said, I hate sales commissions. They are good for the company and bad for the customer. Warren Buffett famously advised, “Never ask a barber if you need a haircut.” Never, never, never, ask a commissioned salesperson what they recommend. Editor's note: Lisa Jessie is an accountant and former news editor who lives and works in Louisville, Ky. She offered to lend us this essay from her own blog about the changes in her own financial life, and we gladly accepted. This is a terrific cautionary tale that perfectly illustrates why it is so crucial to pay down debt and save money. You never know what's coming down the line. When you hear those words from a romantic interest, you know what follows will be bad. When you hear it from your boss, it’s worse. Three and a half years ago, I found the most perfect job I’d ever landed: a flexible schedule, a casual work environment, incredibly pleasant co-workers and good pay – even if the fringe benefits were small. But two weeks ago, I found out that I would join the ranks of the unemployed at the end of May. I’m 41, and I have never been unemployed or – knock on wood – fired. This experience, while not unexpected given the dismal economy, has been surreal. Still, aside from a few tears shed at mid-day and good cry when I came home, I’m surprisingly calm. In some ways, I feel a bit liberated. The workload has been slowing since late 2007, but because of the great work environment, I hesitated to leave. Then the amount of work dropped off precipitously in the last few weeks. In fact, I began updating my resume the night before I got the bad news – because I couldn’t face a summer of surfing the Internet for seven hours a day. I’m also calmer because more than a year ago, I committed myself to improving my personal finances. While I’ve never been credit junkie or a shopaholic and have always been fairly responsible with money, I tend to be more of a spender than a saver. But when I turned 40, I paid off all my debt but my mortgage. I paid off the car loan a few months early, the student loan a year or two early. I moved my credit card balance to a card with a lower fixed rate and paid off the balance. To accomplish these payoffs, I made myself think twice before I bought things, mailed in bigger-than-normal monthly payments and wouldn’t allow myself to charge anything. If I couldn’t pay cash, I postponed a purchase – or gave it up all together. I told myself how great it would feel to have the cash flow to debt redirected to my checking or savings account. For my New Year’s resolution, I vowed not to charge more than I could pay off in full at the end of the month. Amazingly, the resolution has been far easier to keep than my annual vow to lose weight. I had already automated my bill paying and saving, but I knew I needed to build an emergency fund. I did have some savings, so I committed myself to keeping my hands off that account unless it was for major car/home repairs or an unexpected medical bill. I’ve made it to about six weeks’ of expenses, which I think I could stretch to eight to 12 weeks if I supplement it with either a temp job or unemployment benefits. I will also get severance, so I feel confident that I can make it through the summer and maybe part of the fall. However, as it turns out, I won’t need the emergency fund. I've got a job lined up. Simply preparing my resume, networking and searching mitigated my fear and my feeling of helplessness, and so did having my finances squared away. I also know that when I have faced career challenges in the past, I emerged from the dark days stronger, better and wiser. I’m confident this time will be no different. Editor's note: on Mondays, we post a question and answer. We'd love to answer your questions. Post your questions in the comments section or e-mail them to robynsekula@sbcglobal.net. QUESTION: I often hear reporters give T-bill rates on the nightly news. What are T-bills, and are they a good investment? ANSWER: Treasury Bills are short term-bonds issued by the United States Treasury. Maturities are one year or less, and initial rates are determined by an auction system. There is a vibrant secondary market for these short-term bonds, so it is easy to buy or sell them before maturity. Interestingly, they do not actually pay interest because the original buyer gets a discount from the maturity face value. That discount might rise or fall until the holder at maturity collects the entire face value. Why do business reporters talk about T-Bill rates? It's a reliable indicator of what short-term interest rates are doing. Since T-Bill rates are set by auction, they reflect the "smart money" thinking about interest rates and the economy. Banks, large corporations, and mutual funds heavily invest in T-Bills with idle cash. Other interest rates, from bank accounts to money market funds to short-term loans, reflect the level and direction of rates. In brief, T-Bill rates reflect the safest place to park short-term money. It's an important benchmark for other economic factors in the economy. If you have a big pile of money you might need in the next 6-9 months, T-Bills could be the perfect investment for you. simpler way for individual investors would be to use a money market mutual fund which offers similar returns with more convenience. I regularly provide commentary to users of Dad's Divorce, a web site that offers advice for men going through a divorce. The information is appropriate for anyone, though. I'm posting a link below to my latest, which is on kids and money. Editor's note: This week on Twitter, we're giving out tips on securing summer jobs for teens and college students. You can find us on Twitter @family_finances. Contribute your own thoughts on this in comments or in a separate e-mail to robynsekula@sbcglobal.net. Three hours. As a teen, I spent three hard hours shoveling twelve inches of snow from Mrs. Townsend’s lengthy driveway. Finally finished, I requested $15 for the work. She gave me $10, explaining that’s what someone with a plow offered to charge. That day, I learned a painful economic lesson about the value of labor. I just read a superb book. It should be required reading for every college student. Written by Harry Beckwith, it is called Selling the Invisible. The focus is on customer service. Two illustrations caught my attention and helped refine Mrs. Townsend’s lesson from my youth: value is determined by the quality of output, not the quantity of input. No one cares how hard we work. No one cares how many college degrees or years of experience we have. No one cares if we once made a touchdown or hit a gamewinning home run. In business, value is determined daily by the service we provide to customers. People – all of us – seek solutions and results. That’s what matters. We get asked by members of the media periodically to give advice for specific financial situations. One that we've often run across is paying for college. We answered a few questions this week from Geoff Williams, who is a regular contributor to WalletPop.com, an excellent personal financial blog. I'm happy to be quoted on any financial matter, but especially on paying for higher education. When it comes to higher education, there's a vacuum for solid information. People with children see it as an "eventual" need, and use all the usual avoidance techniques to ignore it. Finally (and much faster than anyone expects), it's upon them. Whoa. The college learning curve is way steep and very brief. This type of post really helps. My first paying jobs were working in the corn field de-tasselling corn, babysitting and working in a small town (population 123) grocery store. My Dad was a farmer and self-employed electrician and plumber. My Mother helped Dad, but was also a full time Mom. They paid for our basic needs but any extra activities, expensive clothes, or other optional items outside the family budget had to be worked for. Our car insurance company offered a discount for maintaining a certain grade point average, and if I fell below that, I had to pay the difference in rates. Earning my own money helped me learn how to manage money. I didn't have bills to pay but I had to make choices about where I wanted most to use it. My parents were wonderful providers but once my money was gone, I only got what my parents thought was necessary. My cornfield money went into savings because it was a larger amount paid at the end of the job and, obviously, was only seasonal work. I either kept the other little bit of money in cash for gas, after I was old enough to drive, and other things. Closer to the end of high school, I had a checking account, so I learned how to handle and reconcile my account. When I went away to college, I used money I had saved for expenses, and with the checking account my parents were able to make deposits for me if and when I had things that I had to purchase that were beyond my means. The way my parents raised me taught me to respect money, make choices and budget accordingly. I've always been grateful for their wisdom. Though I certainly did my fair share of babysitting as a young teen, I got my first "real" job as a secretary at a doctor’s office when I was 16. When I started driving, I was required to pay my parents 32 cents for every mile I drove, so having a job was a necessity in order to drive. Getting those first paychecks was really exciting! It was nice to know I didn’t have to ask Mom and Dad for money anymore (okay, so it still happened occasionally). It was like magic – now all I had to do was write a check and it was mine. Luckily, though, I had parents who taught me the importance of saving and passed along some of their financial discipline. I had also grown up knowing I’d pay my own way through college, so most of every paycheck went to savings. And though I saved, I did spend, and I did make spending mistakes, buying things I really didn’t need. It now helps to think of those silly purchases way back when, as a reminder of how much I really don’t need. It definitely changes your perspective as a teen when you have to pay for things yourself. I’m now thankful that my parents didn’t make it easy; I certainly gained appreciation for the dollar having to earn it. Family Investment Center recently hosted the latest installment in its investor education series. The event was held at the East Hills Public Library rotunda classroom at 7 p.m.
Jason Votruba, CFA and portfolio manager for the UMB Scout Small Cap Fund (UMBHX), shared his philosophy of stock-picking in the small company investment universe. Votruba currently hold about 120 different positions in his small company fund. Since Votruba took over management of the fund on January 1, 2001, he has earned a total return of 24 percent, soundly outperforming both the Russell 2000 (2 percent) and the S&P 500 (-21 percent) benchmark indexes. Votruba's strategy is to invest in stocks that have the highest probability of going higher, and sell those that are likely to decline. His philosophy involves studying the biggest winners in the stock market to find common shared characteristics of company's prior to a big upside move. He describes his approach as 80 percent fundamental analysis and 20 percent technical. Attendance at the event was good for a beautiful summer evening in St. Joseph. Several investors in the crowd asked thought-provoking questions. Overall, the event was viewed as quite positive. The next Family Investment Center education evening will be held in mid-summer. Editor's note: On Mondays, we answer a financial question from a reader. If you have a financial question you'd like addressed in this space, e-mail robynsekula@sbcglobal.net, or post it in the comments below. You can also DM us on Twitter @family_finances. QUESTION: I think that the pre-paid tuition plans that many states offer are probably a good deal – pay college tuition now, at today’s rates, for your child’s future education. But I hesitate to do this. My children are very young, 5 and 3, respectively, and I wonder if the plans will still be in tact when they’re ready for college, or if there are any other possible pitfalls to consider. What do you think, in general, of these plans? Or is there another way to save for college? ANSWER: I think anything you can do to prepare your family for the expenses of college is a good thing. My only hesitation about "pre-paid tuition" is that the plans are usually tied to a specific institution. Sometimes, they are tied to institutions in a specific state. That worries me because it reduces flexibility, and if you follow anything I write, you know flexibility is key to financial success. I have three daughters. All three graduated from college, and two of the three have already finished grad school. My youngest is in grad school today. As I sit and think about this, we've paid tuition and fees to Columbia College, Missouri Western State University, Texas Christian University, Emporia State University, Chicago Portfolio School, University of Missouri (Columbia), Southwest Baptist University, and the University of Missouri (Kansas City). That's three (very successful) daughters over nine years, and my simple point is this: it's hard to predict what your child will want or need a decade or more in advance. Any investment plan that ties benefits to a particular school or state could be a problem later. My suggestion is to use a 529 plan for education-specific savings. These plans don't impose limits on where your child or grandchild might attend. Virtually any accredited college, university, or trade school will qualify. Also, for maximum flexibility, I recommend a family investment account (in parents' joint name) to augment the 529 plan. That way, there's a cushion for expenses that might not be direct education costs. Help with a car, for instance, or travel to and from school. Higher education is extremely important today and will simply get in importance over coming years. It's important to plan ahead and set aside money to help your children or grandchildren. Keep in mind, though, that the longer the time horizon, the more need for financial flexibility. Keep as many options open as possible.